Summary: The New York Times bestselling author of The Wednesday Sisters returns with a moving and powerfully dynamic World War II novel about two American journalists and an Englishman, who together race the Allies to Occupied Paris for the scoop of their lives. Normandy, 1944. To cover the fighting in France, Jane, a reporter for the Nashville Banner, and Liv, an Associated Press photographer, have endured enormous danger and frustrating obstacles—including strict military regulations limiting what women correspondents can. Even so, Liv wants more. Encouraged by her husband, the editor of a New York newspaper, she’s determined to be the first photographer to reach Paris with the Allies, and capture its freedom from the Nazis. I'm finally getting around to reading all of the books from BEA 2015! I attended a very cool presentation at Harper Collins, and one book I was extremely excited about was THE RACE FOR PARIS by Meg Waite Clayton. I read Ms. Clayton's THE WEDNESDAYS SISTERS a few years back, and I was anxious to see her approach to a World War II historical fiction story. THE RACE FOR PARIS tells the story of two American female journalists who want to cover the liberation of Paris from the Nazis in 1944. Jane Tyler, a reporter for a Nashville paper, meets Liv Harper, a photographer with the AP, in a French field hospital. They become fast friends and decide that they aren't going to pay attention to the restrictions that are present for female journalists. Instead, the go AWOL and "race for Paris." These two strong women want to beat the Allies and become the first journalists in Paris to cover the story. Along the way they meet Fletcher Roebuck, a British photojournalist, who agrees to help the women get to Paris. Their travels across the French countryside are fast-paced and very dangerous, and these three form a complicated bond that will forever change their lives. 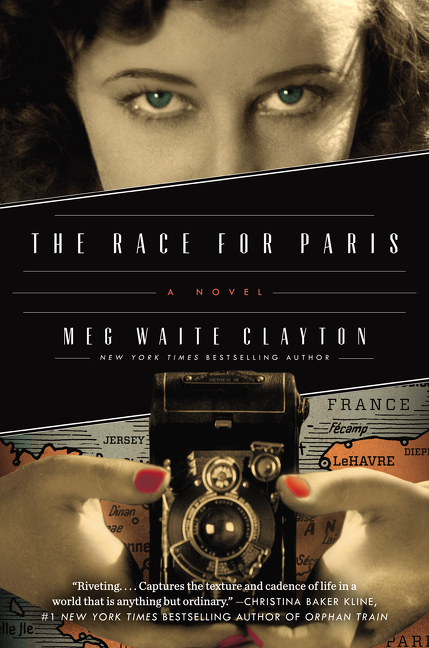 I enjoyed THE RACE FOR PARIS quite a bit and I was very impressed with Ms. Clayton's writing. I knew she was a talented fiction writer, but I think her research of the time period and portrayal of these characters was excellent. I admit that it took me a little bit to get into THE RACE FOR PARIS; however, once I got to know the characters, the story really took off for me. I have a feeling that it was just me -- I must have picked up the book at the wrong time. THE RACE FOR PARIS was a terrific example of what I expect from historical fiction. Granted, I love WWII time period, but I also found the story of female journalists covering the war to be fascinating. Ms. Clayton did a great job of incorporating real-life characters into her novel, and it was evident that she did a great deal of research of the subject matter. In addition, the story and characters were so well developed. I loved Jane, Liv, and Fletcher. Each character brought something special to the story. And the relationship between the three of them was extremely interesting. There was definitely some exciting and dangerous moments, but they were offset by some very tender ones. I appreciated the complexities of their interactions, and the romance aspect was extremely well done. Ms. Clayton's writing was just so good. I've already mentioned her character and plot development, as well as how thorough her research was. However, I think what really made this book so good was that I became so vested in the characters and their lives. I felt the ups and downs of their race for Paris, and I was laughed and cried with the characters along the way. What I really appreciated about this book, though, was that it taught me a few things and made me think. That's the sign of a great book! I think THE RACE FOR PARIS would make an outstanding book club pick, especially if your group is interested in WWII stories or historical fiction. The story is intriguing, but the characters and their actions are also complex enough to provide some stimulating discussion. There is a reading guide available on the author's website as well as some additional information about the war and and female journalists. Some of the themes you might want to explore include friendship, love, the role of journalism during a war, gender and equality issues, censorship, trust, loss, grief, danger, courage, and humor. Trust me when I tell you that there is a great deal to discuss about this novel. THE RACE FOR PARIS is historical fiction at its best. Highly recommended! They were some brave women. You know I don't read much historical fiction but I think I might like this. I reviewed this one on my blog a couple of weeks ago. Like you, I thought it got off to a slow start but it didn't take long before I got into the flow. I agree about it being a great pick for book clubs! I have been wanting to read this since BEA. I was thinking of trying it on auido.